If you do not want your site anymore, you may delete it at any time. Once your site is deleted, we cannot get it back. Only delete your site if you are absolutely sure you do not want it or the content. You can export your site before deleting it by using the Transferring Your Site instructions. 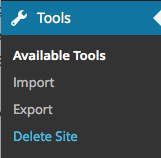 In the Admin Panel, click on Tools > Delete Site. Note: You can still create a new site and keep any other existing sites you have. Click Delete My Site Permanently. An email will be sent to you to confirm the site deletion. Once confirmed, your site will be deleted.